"Peace I leave with you, my peace I give unto you: not as the world giveth, give I unto you." Jesus said, "So peace is on me the day I was born, the day that I die, and the day that I shall be raised up to life (again)"! not shoot people for peace. All we need is love. I believe it. It's damn hard, but I absolutely believe it.
. watch an interview of John Lennon on his vision of Peace. He was protesting Vietnam war and that protest speaks even our today's world and time, we still have wars going on not only in Iraq but often absurdly forgotten many countries in Africa. let all gunfires cease in the world, let all war-machine, guns manufacturing and hypocrisies of war-trade STOP.
. What is IMAGINE PEACE? | the biggest online peace event. It began on October 9th 2007, John Lennon's 67th birthday. we miss you John! we need a visionary, we need someone who care for peace! who care for the world. Happy, Blessed & Peaceful Christmas to you all! 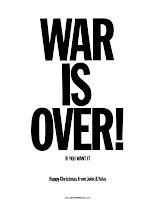 Imagine Peace in this Christmas and all year round. May Peace be with you all. God's love, peace and grace be upon Jesus, the Messiah, Word and Spirit of God.
. give peace a chance!! !